On July 16,1790, the Residence Act approved the creation of a capital district along the Potomac River, a district which would be under the exclusive jurisdiction of Congress, and thus not a part of any state. Both Maryland and Virginia donated land to form this federal district, and the city of Washington, named in honor of President George Washington, was founded in 1791. Today Washington, DC, is known for many things, including its monuments, eclectic neighborhoods, museums, and of course the cherry blossoms. The next time you’re in the nation’s capital, keep these points of interest in mind. Trust us, they’re worth exploring. 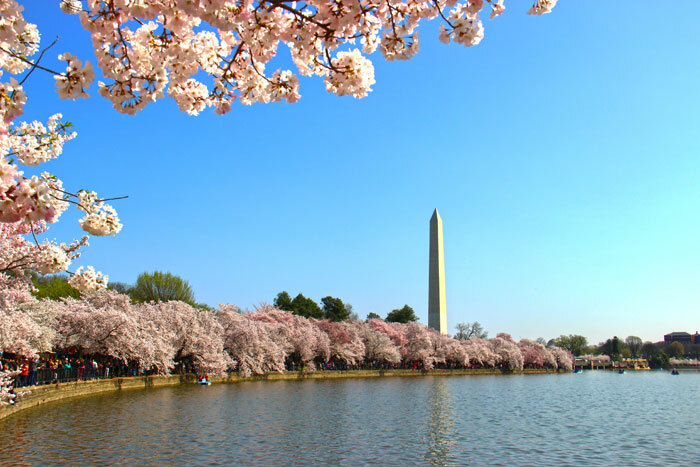 Each year, the National Cherry Blossom Festival commemorates the 1912 gift of 3000 cherry trees from Mayor Yukio Ozaki of Tokyo to the city of Washington, DC. The annual celebration honors the lasting friendship between the United States and Japan, with this year’s festival taking place March 20-April 15. 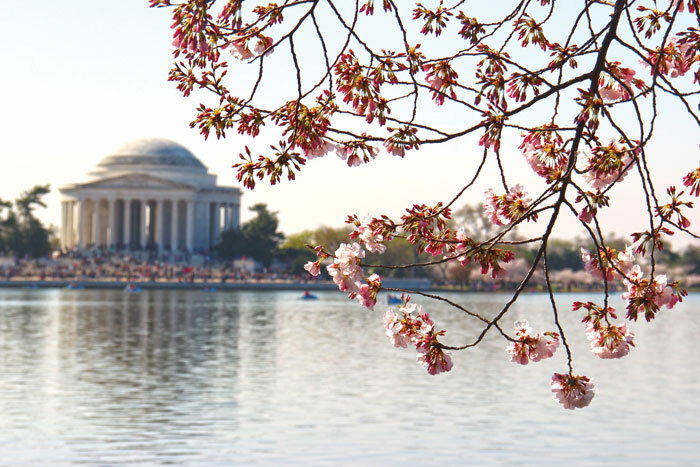 Each year the National Park Service monitors bloom development, but it is very difficult to give an accurate forecast more than 10 days before peak bloom, so stay tuned for updates. The highlight of the festival is the annual Parade, one of DC’s largest spectator events. 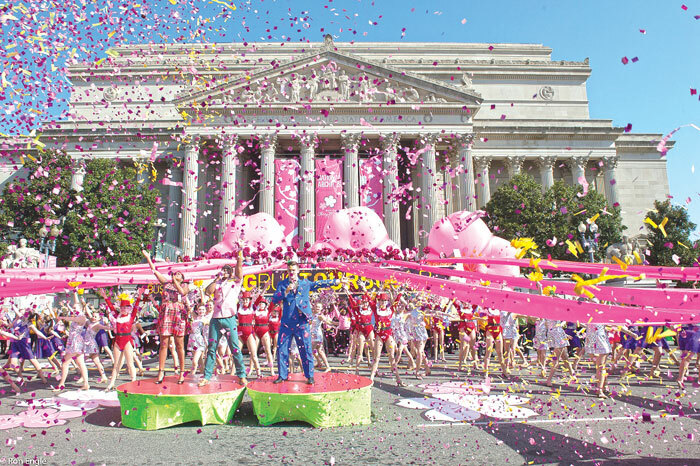 On April 14 from 10 a.m. to noon, the parade will run for 10 blocks along iconic Constitution Avenue between 9th and 15th streets with giant helium balloons, elaborate floats, marching bands, and even celebrity entertainers. Arrive early to snag the best views. Yards Park, nestled along the Anacostia River, is part of the revitalized Capitol Riverfront Neighborhood. Walk across the sculptural bridge for a bird’s eye view of the canal basin, and then stroll along the park’s quarter mile boardwalk that runs along the Anacostia. There is plenty of green space, perfect for a picnic or Frisbee fun, but the big highlight of the park is the canal basin. There are dancing fountains to run through, a waterfall, and the basin is less than a foot deep, making it great for small children to splash around in. An abundance of restaurants are within walking distance, and the park often hosts music performances during the summer months. There’s even a fenced-in park for your furry friends. Learn more here. Some of the government’s most powerful edifices make their homes on the famed incline of Capitol Hill. Visitors can tour the U.S. Capitol where guides lead small groups under the intricately-painted 180-plus-foot dome and past the dimly lit Old Supreme Court Chamber (reservations required). Take a free one hour walking tour of the Library of Congress, America’s oldest cultural institution, or the Folger Shakespeare library, which is home to the world’s largest collection of the author’s timeless works. At the base of Capitol Hill stop off at the U.S. Botanic Garden, free of charge, for a peaceful escape from the bustling city. Head to the National Mall for a plethora of free museums, including the National Gallery of Art, National Air and Space Museum, United States Holocaust Memorial Museum (free, timed tickets required), National Museum of Natural History, National Museum of American History, Hirshhorn Museum and Sculpture Garden, National Museum of the American Indian, National Museum of African American History and Culture, and the National Museum of African Art. A few of our favorite museums that are worth the admission include the Newseum (the story of the news and role of free press: $25), the National Geographic Museum ($15), and the International Spy Museum (the only public museum in the United States solely dedicated to espionage: $23). Centrally located in the Greater Washington Metropolitan Area, the recently opened Wharf reestablishes DC as a waterfront city and destination. This mile-long stretch along the Potomac River features a ton of new restaurants and bars, boutique shops, 10 acres of parks, residences, and a marina. From the water you can launch your own boat or rent a kayak or paddleboard; DC Sail offers sailing lessons, boat rentals, and schooner charters; and two brand-new 88-foot, 149-passenger high speed catamarans from Potomac Riverboat Company offer water taxi service between the Wharf, Georgetown, National Harbor, and Old Town Alexandria, VA. For more activities and upcoming events can be found here.